The Sweet Bookshelf: Let's Connect! There are so many different ways for us to connect. I'm all over the world wide web for your reading convenience. Here is a list of different ways you can get all of my posts from The Sweet Bookshelf, plus so much more! Facebook: You'll get all my posts delivered straight there. If you find yourself on Facebook throughout the day, come on over and see me! I've also got an album for the books I receive each month. Come and see what I'm reading. Twitter: Ya'll, I love Twitter. It is amazing. I'm sharing all my posts there, as well as so much more! I tweet bookish articles I find, Amazon deals, discuss books, and re-tweet authors and publishers! 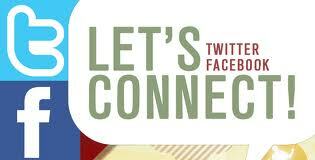 Come and tweet with me. I love twitter! GoodReads: What a great bookish community! You'll find all my reviews in one place here. I join in discussions, enter contests, and mingle with authors! What's not to like! Google Friend Connect (GFC): See that follower button on my sidebar? If you use Blogger to follow your favorite blog, just click JOIN this site to get up to the minute coverage on everything on The Sweet Bookshelf! Follow by Email: Are you an email person? Always checking who's sent you a message? Well, you can get all my posts auto sent directly to your email. Just fill in your email in the sidebar Subscribe via Email section. Google Reader: What is RSS anyway? RSS stands for 'Really Simple Syndication'. Seriously. People describe it as your 'newsfeed' of blog information. Any time one of your favorite blogs has posted, you'll know about it. All in one place. You can create different folders for different kinds of blogs/websites. What's not to like about that?! If you click that little orange sqaure it will take you to a page where you can choose how you'd like to follow The Sweet Bookshelf via RSS feed. Just choose Google and start using Google Reader today! Let's Connect! Hope to see you around!